Home » Health Care » How To Get Rid Of Cramps At School? How To Get Rid Of Cramps At School? For women, monthly period is probably an issue that causes a lot of trouble, which does not only affect us physically but also creates a lot of mentally complications. Many of us have to suffer from a lot from menstrual symptoms such as fatigue, cramps, acne breakout, anxiety and menstrual depression. If you want to learn more about period bloating, read our article at HOW LONG DOES PERIOD BLOATING LAST. Speaking of premenstrual syndrome (PMS), the most well-known symptom is cramps. Each women may have it different. And this comprehensive guide gives you a deep insight onto what cramps are and tells you the much search answer to how to get rid of cramps at school, as cramps only are tiresome, much less having cramps at school where causes a lot of worries for students due to its insanitary and discomfort in many places. Before coming to an answer to “how to get rid of cramps at school”, you need some information about what it is and what causes it. Menstrual cramps, or painful periods, are one of the most common menstrual disorders, and normally, girls have to suffer from period cramps since their first period. It is mostly described as pain in the lower belly area, and can vary greatly between different women. While for some people, cramps are only mildly uncomfortable feelings in the stomach, others may find it unbearably painful when they are getting menstrual cramps. Menstrual cramps happens mostly several days before your monthly menstruation starts and in the beginning of your period. As many of us know, the uterus, or also known as the “womb”, is a muscle. When your monthly cycle visits, there are contractions in it, which can put stress on the blood vessels in the uterus. This declines the amount of oxygen delivered to the uterine muscles and lead to the pain of cramps . Another reason that causes period cramps is the appearance of blood clots which results from excessive bleeding. When you are period bleeding more than usual, there will not be enough fibrinolysin to stop the blood from clotting. If the blood clots get too big, it will be painful for you when they are going through your cervical canal. Find out more about this at IS IT NORMAL TO HAVE CRAMPS BEFORE PERIOD? After you have had the basic idea of what menstrual cramps are and the reasons of them, what you should do is being solution-oriented. Read on to learn about how to get rid of cramps at school. Suffering from menstrual cramps is bad enough, and we cannot stay around at home – the comfort of your own space during menstruation. When you go to school, you have to take part in a lot of physical activities like physical education class, running, walking from classes to classes…while actually only small movements like standing up, sitting down make your blood gush out. When you get cramps, your muscles are tensed up and it causes the pain so what you need to do to relieve it timely. Having cramps makes you want to lie down but you might not be able to lie down when you are in class, so one of the best ideas of how to get rid of cramps at school is to practice breathing exercises. This can be done without difficulty in your class. How to do it: Try to inhale and exhale slowly and deeply to calm the nerves and alleviate the situation. Performing deep breaths helps filling your blood with oxygen. Breath in with your nose and breath out through your mouth. This allows your muscle to relax and reduce the severity of your cramps. Do a set of 5-7 deep breaths at a time. In addition to breathing exercises, you can give your belly and lower back a massage. As a lot of us know, massage can promote blood circulation, and when more blood is sent to the cramping area, it will help ease the pain. You should massage the area that you feel are most stressed. This method can be used when you are sitting in class or in office. Massaging is also a wonderful method to deal with cramps caused by implantation. To figure out more about this, click our article link HOW LONG DOES IMPLANTATION CRAMPING LAST? How to do it: Use your thumb and put pressure to the cramping area in circular motion as it can be more effective in assisting the circulation. If you are having cramps in your lower abdomen, massage around the hipbone region and if your lower back is hurting, you can try massaging in circles near your spine. It can gives you good relief when the situation is severe. Dietary habit plays a vital role in your health condition. You should always be prepared for when your menstrual cycle is coming. Now you want to know how to get rid of cramps at school. Eat foods packed in calcium. You should keep track of your cycle by taking notes on your calendar or private notebook. A few days before your period starts, you should eat more calcium rich foods. It will greatly relieve your cramps and you will feel more healthy when your period comes. Kale, sardines, yoghurt, broccoli, watercress, bok choy, okra and almonds are non-dairy foods that are very rich in calcium . A lot of sources suggest carrying a banana to school. Bananas are well-known for being healthy, their richness in potassium, and you can most certainly bring one to school along with your lunchbox. Eating a banana will have a quick effect on reducing the severity of your menstrual pains. Other foods that are loaded with potassium are avocados and sweet potatoes. Keep yourself fully hydrated. Being well-hydrated can actually help your body keep cramps at bay! Take a sip of water when you feel like the cramps are overwhelming for you. It will calm your nerves and relax your muscles. Besides, drinking water makes the toxins in your body exit more easily. It is quite easy to have a bottle of water handy when you are at school. Drink enough water everyday, especially when you are on your period and having cramps. Say no to generally unhealthy foods and drinks, such as junk foods, caffeinated beverages and alcohol. The big answer to “how to get rid of cramps at school” may lie in the foods and drinks that you are digesting. Trans fat, found in junk foods like processed foods and fatty food, can make your menstrual symptoms worse because they can fuel inflammation in your body and your pains will be more serious. Apart from junk foods, caffeine is another bad factor contributing to the severity of period cramps. It can heighten the tension and make the blood vessels tighter, making menstrual cramps way worse. Also, alcohol is not a good friend of menstruation, because it has diuretic property that retain the excess water in the body, leading to water retention and causing your cramps to be more unbearable. You might not know this just yet, but some essential oils really can give you an answer to “how to get rid of cramps at school”. Essential oils are mostly used indoors and are known to help reduce the stress in your body and mind. They take care of the imbalanced hormones in you body and soothe your tension. Bringing a bottle of essential oils is easy for you because you can extract it into a light and portable bottle, and can be applied whenever you feel like the effect is wearing out. What kind of essential oils should you use to prevent cramps at school? The safest bet is peppermint, sage, thyme and lavender essential oils. Applying essential oil to the cramping region will relax your muscles and reduce the pain caused by constricted blood vessels. How to use: You can either inhale essential oils or apply them onto the region where you feel the pain. Rub a few drops of mentioned essential oils on your wrist so you can occasionally take a sniff when you are at school. If you choose to use it topically, you can just put a few drops of essential oils on your belly and give it a few minutes of massage before you get dressed and leave for school. During that time of the month, you should have some heating pads close at hand in your house. You can buy stick-on heating pads or maybe prepare a bottle of hot water to put on your belly or lower back. However, a heating pad works better than a bottle when you have to go to school. You only need to open the package and stick it onto your abdomen. This can be your savior and the solution to “how to get rid of cramps at school”. 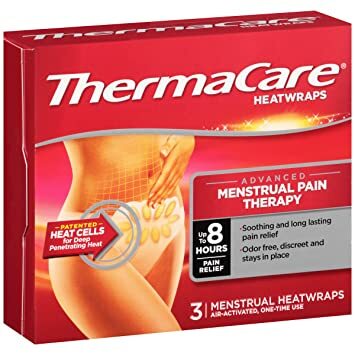 Heating pads like THERMACARE is very convenient for you because they are very thin, undetectable under your clothes. When you are wearing a heating pad, the severity of the cramps can be alleviate and the heat will relax the tense muscles and relieve the pain. Some heating patch can keep your belly warm for hours, but be careful not to get overheated. If your menstrual symptoms do not subside after you have followed the instructions above or if they are too severe, maybe it’s time to take some medications. OTC stands for Over The Counter, which means you can buy these medicines at a pharmacy and there is no need for a doctor’s prescription. You can take pain relief medicines before going to school but remember to read the instructions of the pills or you might get in health trouble. A lot of medicines require you to take with meal. Normally cramps begin to happen at several days before period and medication are most likely to work their magic when your pain is not too strong, so you should start taking medicines two days before menstruation and two days into period. The medication that you can take a look at is Non-Steroid Anti Inflammatory Drugs (NSAIDs). 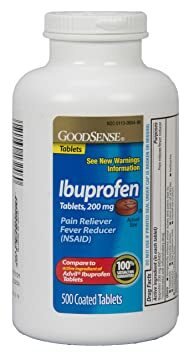 There are a variety of NSAIDs but we recommend that you take IBUPROFEN, acetaminophen or Midol, but the fact remains that you should seek non-chemical methods to relieve cramps at young age. This is because your body needs to grow and build a strong immune system and better pain threshold. Drugs can also have side effects to them such as negative impact on your stomach, nausea or headache. If you do not know how to get rid of cramps at school by taking medicines, you should talk to your doctor and ask for directions before taking medications. Attending school might mean sitting in one place for a while, and that does not do good to cramping situation. It is suggested that women who suffer from cramps do gentle workouts because when you start to move, your body will naturally produce the endorphin hormones. These hormones are your body’s self-producing pain relievers, and they are very beneficial in ease the pain from cramps. But since you are at school, you can encourage endorphin production by taking a walk or climbing stairs in breaks or lunchtime. Walking from class to class is actually a good thing in this situation. Get active, and that is the answer to your question how to get rid of cramps at school! We have showed you some effective strategies to deal with menstrual cramps. However, if cramps are wearing you out, you need a good rest. When you are well-rested, your body will thank you. You will feel so much better because as your body feels healthier, it will be easier to make the cramps go away. If you are at school, talk to your teacher or friends and have them help you to get to the nurse’s office. You can lie down, breathe and relax there and your cramps will go away. This might actually the best remedy on how to get rid of cramps at school. Health is the most important thing to each and everyone of us. You shouldn’t have to be worried because cramps are inevitable when you are on your period. This article has given you some ideas on how to get rid of cramps at school like giving yourself a massage, making dietary changes, using essential oils and heating pads, etc. If you feel like your cramps do not subside for too long or if it comes along with other severe symptoms like fever, headaches or vomiting, you should consult your doctor for more instructions. Feel free to leave a comment if you have any questions or opinion. And if this has been useful for you, don’t forget to hit SHARE! My name is Jelly. I am a nurse who are working at a National Geriatric Hospital. However, I love writing and sharing natural and beauty tips. I am a contributor for Lifehack and Instructable for a long time. Now, I start blogging to bring a different and valuable information to your life. How To Get Rid Of Chills And Stop Shivering When Sick? CareKees.com is a participant in the Amazon Services LLC Associates Program, an affiliate advertising program designed to provide a means for sites to earn advertising fees by advertising and linking to Amazon.com. Additionally, CareKees.com participates in various other affiliate programs, and we sometimes get a commission through purchases made through our links.